There is a restaurant in Hyderabad that my parents used to favour. Serengeti. And like the Serengeti in Africa, presumably since I haven’t visited, the decor mimicked a sanctuary with animated animal models. Giraffe necks fixed on hydraulic pumps seemed to float next to massive tree trunks, birds flapped and cawed while rhinos and water buffaloes added to the soundtrack. Best of all, waiters were dressed in khaki safari suits with shorts, hats and culling belts; the whole nine yards. Talk of yellow mustard makes me think of Bengali cuisine, where it is expertly used. So, while I have been tinkering to get my blend of spices right, I have consulted with some Bengali friends for tips on using this pungent but exquisite spice judiciously. Here is my recipe for Sunehra Murg- it probably isn’t the only one combining all the ingredients below, but one that I dreamed of while tinkering in my kitchen. I have tried to take what I like best of the curries from eastern and southern Indian cooking – bringing together the tang of mustard with sweet muskiness of coconut. Total preparation time: 1 – 1.5 hour. Passive – 20 minutes; Active (cooking) – 40 to 60 minutes. 2 to 2.5 pounds bone-in, skinless chicken thighs. ~ 1 kg. Fresh coriander leaves for garnish. Total preparation time ~ 1 hour. Passive – 20 minutes, Active – 40 minutes. Begin by cleaning chicken. I usually get bone-in chicken thighs that have their skin on and remove the skin at home. Gently wash before removing skin, then pat dry with a paper towel and keep aside. 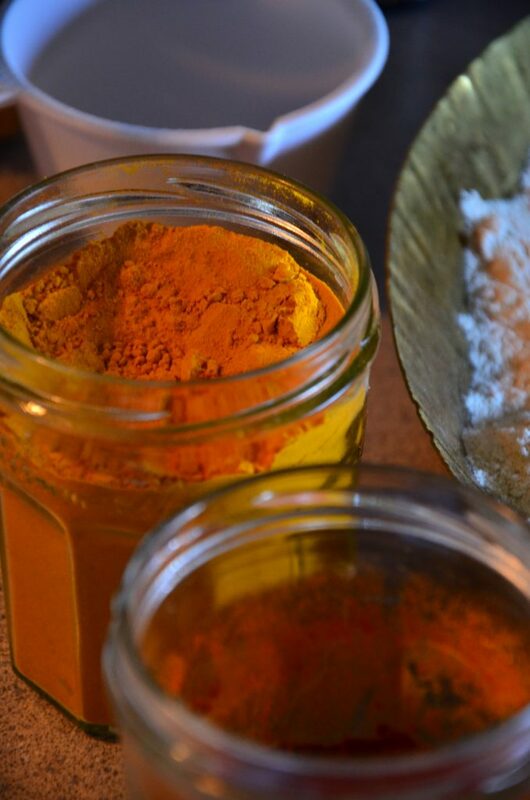 Mix a spice rub using salt, pepper, turmeric, chilli and coriander powders. Rub this into chicken pieces and let it sit at room temperature while you prep for the curry. PART 1. Measure each in a separate bowl and then proceed to roast them one at a time. I use a counter top oven toaster grill (OTG) on the toast setting for about 2-3 minutes per ingredient. Peanuts take slightly longer ~ 5 minutes. Another method is to put a griddle or flat-bottomed pan on the stove and heat it on medium. Then add seeds and nuts (one at a time- sesame, mustard and peanuts ) and roast stirring with a wooden spatula. Peanuts should be roasted until the skin changes color to a bright pinkish-red, mustard seeds until they are darker in color but black and sesame seeds to a light brown. After this, blend together with coconut and a little water (~ 1/4 cup) in a blender. You should get a thick paste. Keep aside. The next and final step is where all our ingredients will come together to make the curry. Take a heavy bottomed deep pan or wok and warm it on medium high heat for a minute. To this add oil, then asafoetida and the following ingredients from PART 3- cumin seeds, coriander seeds, cinnamon sticks, bay leaves, cardamom and curry leaves. Mix these together and let them cook for a minute. Next add 1 chopped onion and cook it until translucent. I use either red or yellow cooking onions in Indian recipes. At this point add chicken that has been marinating in the spice rub. Saute one side on medium heat and turn. Once pieces have browned on either side add the ground paste prepared earlier with coconuts and roasted seeds. Mix well to coat all of the chicken. Check with a fork to see if chicken is cooked. The innermost meat should not be pink at this time. If it still is pink let the curry simmer for a few minutes longer. 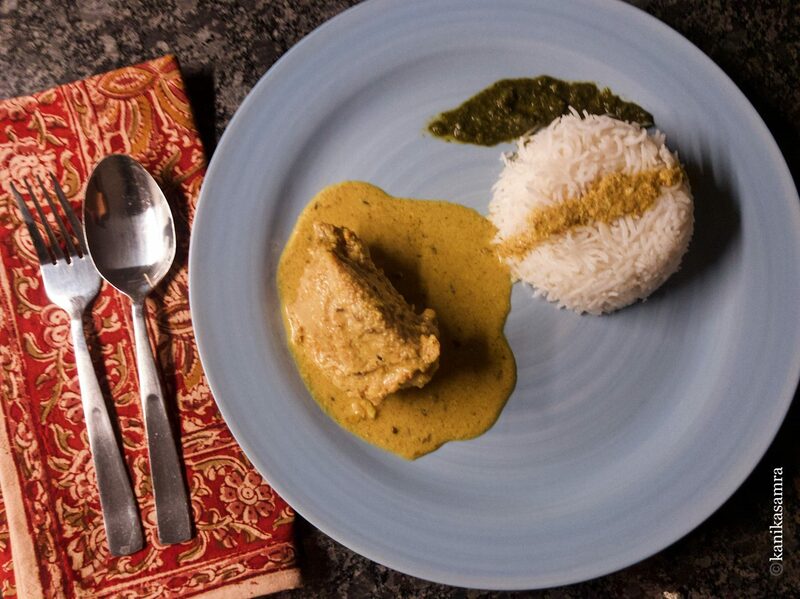 Serve with freshly made Basmati rice, salad and a corainder-mint chutney. Enjoy! Plated for a satisfying meal with rice and green chutney.